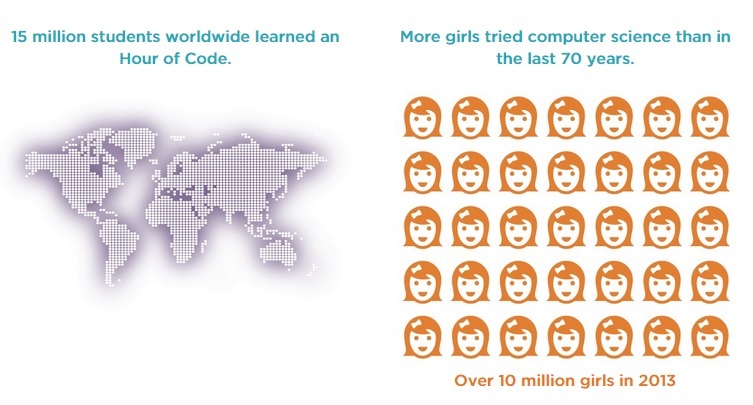 The idea behind an hour of code is to expose students to coding in a fun and accessible way. They provide videos, teacher resources and some well developed lessons or activities that can be offered anywhere. There is a focus on Computer Science Education Week where they help organize events to bring and hour of code to schools across the world. This year there is a goal of reaching 100 million students by the end of the year. There is a “movement” called An Hour of Code. it’s part of code.org which is a not for profit 5013c organization. There goal is to bring coding to the masses, especially children. It is a well funded highly organized force in the learn to code movement. If you are a teacher you should check out this resource. Include a little coding during your computer time, or math time or science time. I have taught lessons from this curriculum and they are excellent. Kids can work at their own pace and the site provides tools you can use to see how everyone is doing. Last year their tutorials used characters and sounds from the popular games Angry Birds and Plants vs Zombies. This year they are using characters from Disney’s Frozen movie (I told you they were well funded and connected). Anyone can take the tutorials you don’t have to be part of a class and the videos do a nice job of explaining what you are doing and why you are doing it.